Hello, I’m Gare, one of the translators on Tokyo Babel. Specifically, I worked on the opening scenes of the game (that’s basically the prologue and the common route), as well as the entirety of Raziel’s route. So this was… an interesting project to work on, primarily because it’s an action-packed chuuni game with plenty of fights, and that usually means tons of over-the-top scenes and lines – you might’ve even seen some of them in the game’s second trailer. These are usually both the most fun and the most challenging to work on, because whatever may sound cool in Japanese won’t necessarily have that same effect in English, so you constantly rack your brain trying to come up with a phrasing that conveys the meaning *and* sounds cool in English. You have no idea how insane this process can be sometimes, but it’s also quite rewarding when you finally have a line you’re satisfied with. Of course, this is often preceded by 30 minutes of me and Conjueror messaging each other back and forth with tweaks and ideas before we can agree on something, but hey, that’s just how it is. A notable example that gave me quite a bit of headache was the previously mentioned trailer’s “Hark, sinner” incantation, when protagonist Tendou Setsuna (voiced by Kamiya Hiroshi) does his big speech in one of the cooler scenes of Raziel’s route. This is his crowning moment of awesome, to put it in simpler terms. To give you a more direct example of what I mean, one of Setsuna’s opening lines are汝の罪は狂ったことである, which literally means “Your sin is that you went mad”, but in English that doesn’t quite fit the gravity of the scene. The Japanese line also uses 汝, which is basically the equivalent of “thou”. It’s such a simple idea, but it needs to intimidate and overwhelm, so what do you do? And this is how the line ultimately became “Thou hast sinned when madness tainted thy heart”. The rest of the lines in that chant were translated with this mindset as well. At other times, though, things are basically decided in minutes: for instance, when we had to come up with a subtitle for the game. The thought process was basically “well, the characters are on a pilgrimage and it’s the end of the world, so… I guess they’re pilgrims of the apocalypse?” And so the game’s official English subtitle – Pilgrims of the Apocalypse – was born, just like that. If only everything went this smoothly! 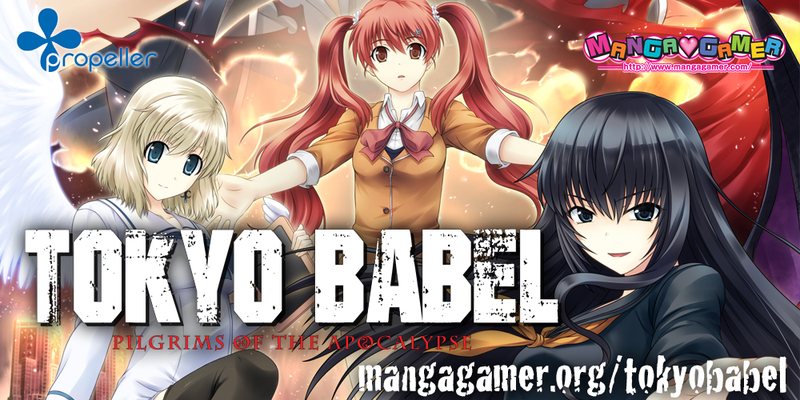 I may have said this several times in the past, but Tokyo Babel – despite being primarily an action-oriented title – also does quite well in the comedy department, specifically when it comes to its main heroines, voiced by superstar voice actresses Sawashiro Miyuki (Lilith), Hanazawa Kana (Raziel) and Itou Kanae (Sorami), all of whom bring something unique to the table in their own styles. And although Sorami is probably my favorite heroine with her often wacky, high-energy personality (in fact, I feel like she might end up being a fan favorite among readers), I chose to translate Raziel’s route because its finale – and revelations – stayed with me the most. Without going into details, it had the sort of ending(s) I personally enjoy the most in this kind of story, and dealt with concepts I found pretty interesting. Not to mention the route’s penultimate boss fight was also pretty cool. In the end, Tokyo Babel was definitely a project that allowed for more creativity in terms of flexing one’s writing muscles due to all the chants and grandiose lines, so I’m quite thankful to have been able to work on this as opposed to a syrupy sweet moege, or something along those lines. In any case, I hope you’ll have fun reading it! Tagged tokyo babel, translator's corner. Noticed a strong Evangelion influence for the artstyle in that conclusive battle, loved it.